Last night I was very fortunate to see a performance of work by Ha-Yang Kim at Roulette. The first piece, Metasmatter, was performed by a mixed sextet comprised of piano, flute, violin, cello, bass clarinet and percussion. This is a wonderful eclectic piece clearly influenced by jazz and Balinese music, and was performed with much exuberance by the assembled musicians. The second piece, not listed on the original program for the evening, was a performance by Kim and percussionist Nathan Davis, who have frequently worked together as the duo Odd Appetite. They played Sotong, a small and delicate work of Kim's, originally scored for theatre, involving a loop of cello recorded and repeated through guitar pedals coupled with delicate melodic counterpoint on cello and metal percussion instruments. The third piece was a debut performance of Threadsuns played by the Flux Quartet, who announced Kim as their newest member. This was easily the highlight of the evening. The piece is in three movements. The first movement is a bracing, discordant rush of halting themes that reminded me of the filmic soundscapes—Decasia and Gotham in particular—of composer Michael Gordon—which indicates something of the magnitude of the sound the quartet was able to generate. The second movement is a restrained and subtle exploration of microtones and harmonics, a frail echo of the first movement, as if we were standing amid the final ripples of a wave smashed against the walls. The third movement is a gradual extraction of the melodic core of the themes hinted at in the earlier movements, culminating in a beautiful unrestrained outpour of sound ascending to the climax. Like all of the work performed, the piece as a whole exhibited a pure blend of traditional Eastern and contemporary Western musical influences, and a perfect balance of traditional and experimental lines of musical heritage. In introducing the piece Ha-Yang described the origin of the title in Paul Célan's Fadensonnen, and how the piece represented for her a vision of the sun as a symbol of wholeness in contrast to the fractured nature of the contemporary world—and it is natural to superimpose the image of a fitfully rising sun over the work as a whole. 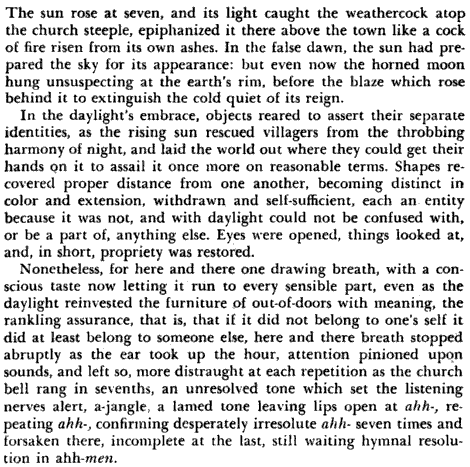 William Gaddis, The Recognitions, Harcourt, Brace and Company, New York, 1955, p. 700. Kim's debut record Ama was released last year by John Zorn's Tzadik label, and we can only wait patiently for a recording of Threadsuns.